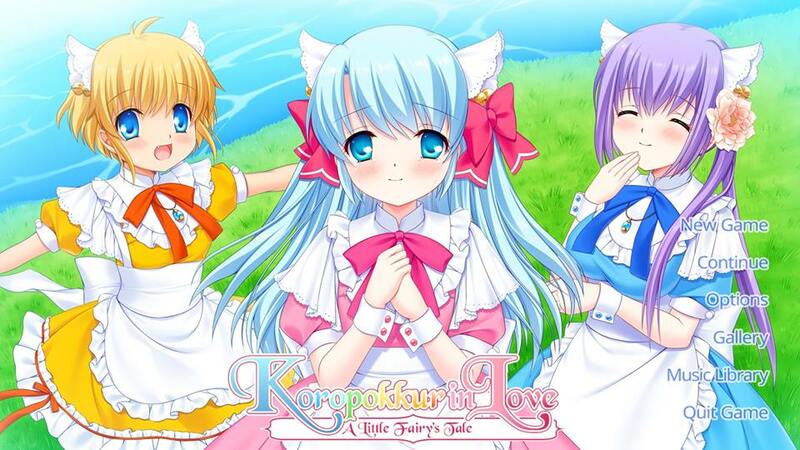 A while back, MangaGamer did their first ever in-house development project Koropokkur in Love ~A Little Fairy~ via Kickstarter. 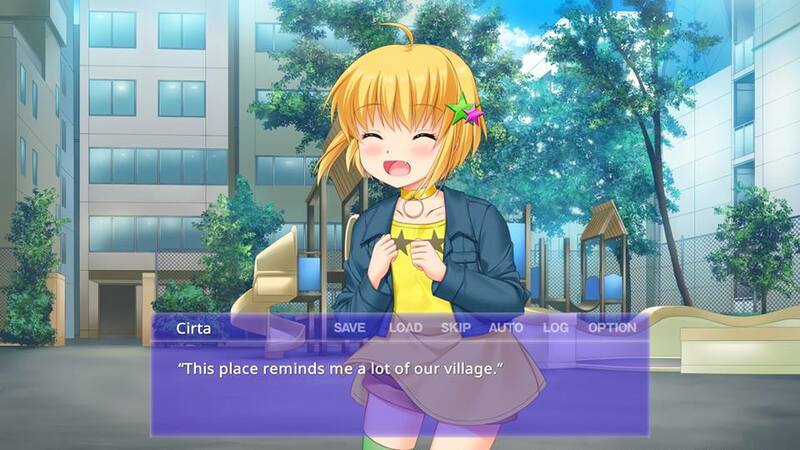 This enlisted many talented folks for the project including the well-known art and character designer Hinoue Itaru, who has done work on Kanon, CLANNAD, and Rewrite. I was very interested to see how this project would turn out and now that I’ve had a chance to check it out let’s find out! The story begins with a Koropokkur fairy named Asirerra. She has big dreams to leave her hidden village and travel to the human world. 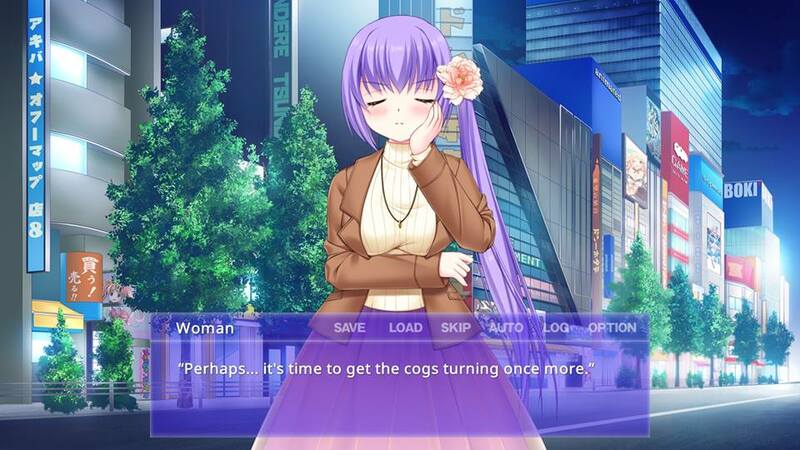 She soon does just that, but upon arriving in the human world things do not go exactly as she had planned. Disguised as a human, Asirerra is quite overwhelmed by all the hustle and bustle of the world. Asirerra soon encounters Satoru, a young man trying to start a maid cafe called Petit Fille. She makes quite a stir while he is running an event to promote his cafe. After accidentally ruining his event and putting him in a terrible spot, she agrees to work for him until he gets back on his feet. Asirerra’s secret of being a Koropokkur fairy is let out of the bag quickly. She suddenly transforms back into her normal form in front of his very eyes. Satoru has lots of questions, but is a very understanding guy. He agrees to give her a place to stay and trains her to be the best maid possible. They will soon by joined by her friends Cirta and Haruante and their misadventures have only just begun! While this is one of the most basic romance stories you’ll ever read, I thought the characters here were just plain wonderful. Asirerra is that very shy and cute girl that just gives off that natural vibe of happiness. You instantly want to protect her and see her smile. Cirta is the wild tomboyish girl that is all brawn and little common sense. While she doesn’t always think things through and she usually ends up causing trouble for everyone, her heart is in the right place. Haruante is the cold and calculating friend everyone needs. She may come off as bit cold at times, but she does whatever she needs to in order to accomplish the task at hand. Her ability to transform creatures into servants comes in handy more than once, but can go very badly if she is distracted. Throw the mild-mannered Satoru into the mix and you have a recipe for a really serious but also very comical romance. He’s a pretty straight-laced guy and I really thought his reasons for wanting to keep the cafe going were great. Him and Asirerra fit together really well and you find yourself rooting for them very early on. This visual novel is proof that sometimes you don’t need a huge overarching narrative to make a great story. Sometimes all it takes is some good characters with great chemistry. The pacing could’ve been a bit better here, but this one isn’t very long, clocking in at about five hours so it’s not that big of a deal. The character designs by Hinoue Itaru are just plain fantastic. 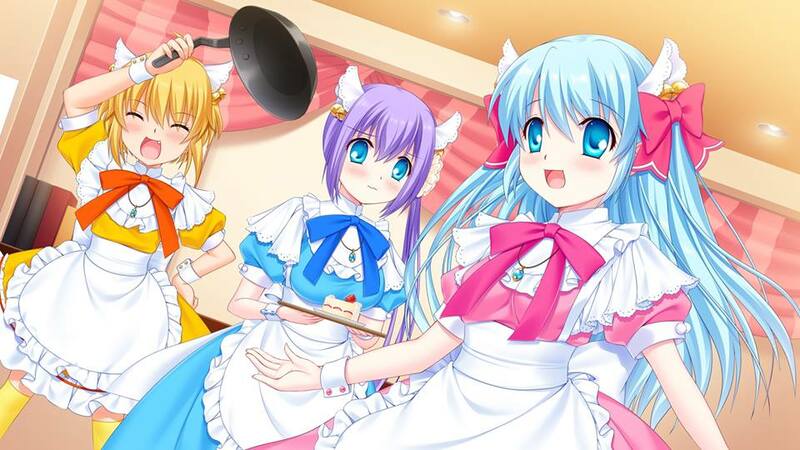 All three of the girls look super adorable in both their maid outfits and casual clothes. I think Asirerra was the cutest, but I’m probably a bit biased here. There are not a lot of backgrounds to speak of since most of this game takes place in the cafe or Satoru’s apartment. They are by no means bad, but I don’t think there is anything about them that really stands out either. The music in this game was a pleasant surprise. I wasn’t really expecting much going into this since a lot of indie visual novels tend to skimp in this area, but these tracks really delivered. The opening song “Sunflower” is great, and the ending theme “Smile Again” really brought this one home as well. I really enjoyed other tracks here such as “After the Rainfall” and “Being with You.” They really added to the overall presentation of the story. There is no voice acting here, which some may find kind of a bummer. Overall I enjoyed my time with Koropokkur in Love ~A Little Fairy~. The story may be a bit basic but the characters here make up for its shortcomings easily. The music is great and the character designs are just plain wonderful. This one is a bit short and the pacing of the story is a bit lacking, but for the $14.99 price tag I have to say it is worth it to spend your time with such an adorable crew of fairies.